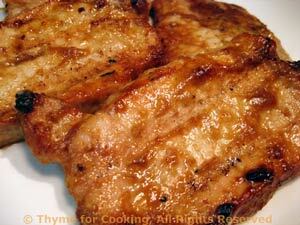 Grilled Pork Chops with Peanut Marinade, Thyme for Cooking gourmet menus. Dinner from the grill - no indoor cooking required! 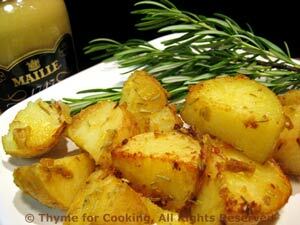 The mustard keeps these from getting as brown as most grilled potatoes, but it also keeps them very moist. Cut potatoes in 4ths the long way and then in thirds the short way. Put remaining ingredients into medium bowl and mix well - it will get thick. Now you have two choices: you can put them in the oven on a baking sheet with lip (trusty round pizza pan) and bake at 400F (200C) for 35 minutes, or put them in an old 'for barbecue only' metal pan and cook over direct heat on the barbecue, stirring frequently until brown and done, 20 - 25 minutes or over indirect heat for 35 - 40 minutes, stirring occasionally. We don't often think of onion as a vegetable.... It is. Combined with shallots and tomatoes it makes a lovely side dish. Peel onion, cut in half, then cut each half into 4 wedges. Peel the shallots and cut in half. Put olive oil and vinegar in a medium bowl, add all onion and shallots. Toss well to coat. Put into 'grill pan' (a metal or foil pan dedicated to use on the grill) NOT a mesh grill pan. Cook over medium heat 15 - 20 minutes. 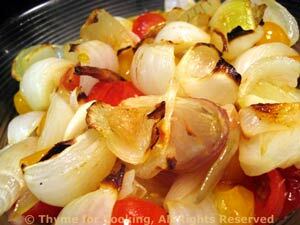 Cut cherry tomatoes in half or larger tomatoes into wedges, and add to shallots and onion. Stir to combine and cook another 5 - 8 minutes. OR: Put onions and shallots onto a baking sheet with a lip (my trusty 'pizza' pan) and roast in 400F (200C) oven for 25 minutes, adding the tomatoes for the last 10 minutes.